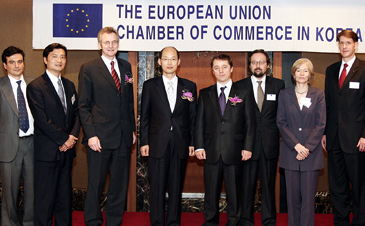 KFDA Commissioner Moon Chang-Jin (4th from left) poses with EUCCK members at Lotte Hotel on April 26, 2006. Mr. Moon Chang-Jin, commissioner of the Korea Food & Drug Administration (KFDA) delivered a speech on KFDA's policy in 2006 at an EUCCK luncheon meeting at Lotte Hotel on April 26, 2006. Among the VIP participants were Mr. Tim Oakes, CEO of Unilever in Seoul and Mr. Jozef Hlavac, CEO of Hieneken in Seoul. During his speech Moon stressed need for food safety. The following is the full text of Commissioner Moon's speech. Honorable Chairman Oakes and Honorable Chairman Hlavac of the Food and Beverages Committee! Commercial attaches and counselors from the European Union Embassies! And distinguished guests! I would like to extend my gratitude to the European Union Chamber of Commerce in Korea for giving me this opportunity to stand before you to address on you KFDA's policies on the food and drug safety management. Recent increase in trade precipitated by globalization and the liberalization of imports led to rapid rise in foods imported from other countries. As of 2005, food imports amounted to $7.5 billion. In addition, mounting interests in healthy lifestyles and quality of life increased expectations on and awareness of safety. Even though Korea's national income is yet to surpass $20,000, the expectations are reaching the level found in countries whose national income exceeded $30,000. Regarding food safety in particular, issues which had not been considered seriously in the past began to draw public attention as suppliers failed to match the safety level demanded by consumers. A major shift from quantity to quality and safety is taking place. As evidenced by the Kimchi and the eel crises which gripped the entire Korean society recently, imported foods became a frequent source of friction. Therefore it is required to improve the inspection system for imported foods. Not only that, it is time for the entire members of the global community to make joint efforts so as to promote food safety, as they did to address mad cow disease (BSE) and avian influenza (AI). Compared to the high sensitivity to food safety, public understanding of standards was found to be insufficient. Due to lack of understanding of the standards adopted by relevant authorities, minor issues were sometimes exaggerated and gave unreasonable results. At other times, speculative reports of the press and consumer advocacy groups rippled across the society in a negative way. In Korea, food safety has been managed by many government agencies so far. For example, the Ministry of Agriculture and Forestry is responsible for management of agricultural products, livestock products and processed livestock products while National Tax Service is in charge of alcoholic beverages, the Ministry of Environment of drinking water, and KFDA of other processed foods. As such, the food safety management scheme has been disintegrated according to food types and regulators with its focus put primarily on producers. Therefore, transfer of authority was not efficient and horizontal cooperation or information exchange between agencies were not fully promoted. Against this backdrop, the Korean government has made strenuous efforts to reintegrate the scheme, shifting its focus from producers to consumers. It has also tried to build a preventive management system by increasing participation of stakeholders as well as the general public, weaning itself from the after-the-fact style of policy making. Apart from foods with internationally accepted standards including Codex, it took considerable amount of time to prepare standards for new substances such as GMO, dioxin and acrylamide even though the needs for a global consensus on their use had been recognized. In this regard, bilateral or multilateral partnership should be built to pursue interactive communication and robust exchange of varied information on food safety, thereby generating the international consensus. To this end, KFDA has made strenuous efforts. Regarding the drug area, it became more important to secure quality of drug in distribution after the separation of drug prescription and distribution. As more and more consumers ask for information on the drug safety, it is time to create a new safety management scheme and international coordination of regulations, to respond to development of the BT drug and medical devices. In this respect, a prior consultation system was adopted to promote commercialization of the BT drug. The Medical Devices Act set the institutional framework for safety management of medical devices and contributed to collection of information on drug safety such as side-effects on an ongoing basis. To shift focus of the drug safety management from producers to patients from the initial production stage, the list of DMF was expanded to cover bio-equivalent and frequently prescribed substances, let alone primary substances of new drug. Also, regional drug monitoring centers were designated to pilot systematic collection of drug side effects and scientific assessment systems. Evaluation and safety management systems which are appropriate to increase quality control of medical devices in distribution and to promote new devices based on new technologies. In addition, approval standards and criteria for new drug were changed into CTD. The safety and efficacy testing system was improved to reduce time required for inspection. To support these changes, greater efforts will be made to increase international cooperation in the drug field. KFDA reiterates that it has done its best to coordinate the local standards with international ones in adopting and implementing them to secure safety of food and drug whether they are manufactured locally or imported from other countries, and to prevent possible discrimination in the markets. I hope that my brief introduction of the current food and drug safety management in Korea and policy directions for coming years will help you deepen your understanding to remove any difficulty you might have in relation to the food and drugs trade with Korea. Also, I would like to ask for your assistance in ensuring safety and quality of imported products, thereby increasing international credibility and meeting the expectations of Koreans.